"Such separation is vital for various reasons, such as treating nuclear waste, dismantling nuclear weapons, or purifying americium for smoke detectors," said Kenneth Hanson, who leads a light-driven americium separation project at the Center for Actinide Science & Technology (CAST) Energy Frontier Research Center and is an assistant professor at Florida State University. The Department of Energy's (DOE) Office of Science funds the center. Americium is just one of the elements that scientists must deal with to clean up sites where the nation's nuclear arsenals were built. Managing these elements means uncovering scientific secrets about highly radioactive troublemakers in the 93 million gallons of waste stored in Washington State and South Carolina. "It is on a scale that is sometimes hard to fathom," said Thomas Albrecht-Schmitt, a professor at Florida State University and CAST director. "It is staggering." The waste treatment plan calls for vitrification, a high-heat process that traps radioactive elements in solid "logs." Easily removing americium, which generates unwanted heat, and storing it separately from the logs or reusing it could simplify waste treatment. Hanson and his colleagues' research relies on a stringy molecule that bonds to all the elements in the beaker. Light excites just the americium and causes the strings to permanently change. It makes the troublemaker stand out and easier to separate from uranium, plutonium, and all the other heavy elements at the bottom of the Periodic Table. "They are in an exotic area of the Periodic Table," said Stosh Kozimor, a CAST scientist at DOE's Los Alamos National Laboratory. Known as actinides, these elements are enigmatic because they're extremely difficult to extract, compared to more common elements such as nickel or iron, and the amount of planning, safety precautions, and cost differs wildly. Heavy elements have the most electrons compared to other elements on the Periodic Table. Swirling around the atom's core, electrons influence how an element bonds to the other elements around it. Weak bonds mean elements could leach from the glass logs. Strong bonds keep troublemakers in. This matters when examining alternatives that could be made using less energy. "The logs are really stable, but we need 2000 degrees [Fahrenheit] of heat to make them," said Albrecht-Schmitt. "We are trying to make materials that are just as stable—that bind heavy elements—but under much milder conditions—say temperatures around that needed to boil water." Finding experts and friends. Uncovering the mysteries of heavy elements requires a team with diverse perspectives. "This center," said Hanson, "is about bringing in people with different expertise and that can build collaborative bridges between their areas and come up with something new and interesting." For example, Hanson, a photochemist, focuses on solar cells. "Basically, I came from the perspective that light can solve all the world's problems," said Hanson. "Tom [Albrecht-Schmitt] knows all about the heavy elements. Together, we can solve problems." Another aspect of diversity at CAST is experience working with radioactive materials at user facilities. Kozimor is quick to credit the user support team at SLAC National Accelerator Laboratory, where he works with synchrotrons. "SLAC has an outstanding safety group and a whole team of beamline scientists and engineers that want to work on radioactive samples," said Kozimor. A team as diverse as CAST only works if people are willing to share ideas and work together. "Finding people that you can trust to share ideas with and be creative with is big," said Kozimor. "At CAST, we have those people." "I'm delighted with how things are going," said Albrecht-Schmitt. 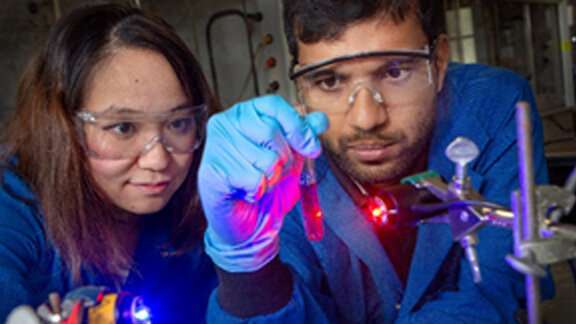 Navigating through the challenges, the team is making the long journey to discover how heavy elements behave to light the way to fine tuning nuclear waste treatment.